It’s true good things do come in small packages. With one purchase you can get a sample of 8 artists work. The Etsy Glass Artists (EGA) have put together a selection of sample sets for our summer promotion, a celebration of all things glass. Each collection will include 8 pieces. By one of 12 artists. The collections are composed of jewelry, gifts and designing components. Priced well below their value, it is a wonderful way to try out a variety of glass pieces. Shipping is included in the price of the EGA Collection and each participating artist has a different collection so be sure to check them all out. EGA would like to thank Susan Sheehan for all her hard work putting the glass collections together and organizing this project. 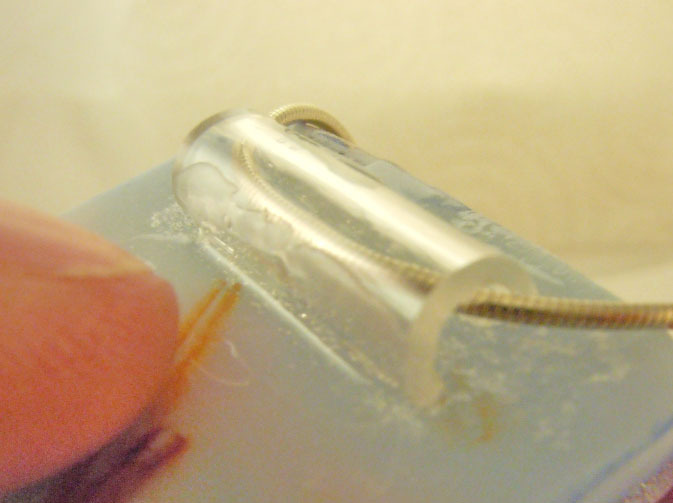 When I started fusing 8 years ago, the silver bails you see on pendants were nowhere to be found so all my pendants were made with a channel that was made with fiber paper. 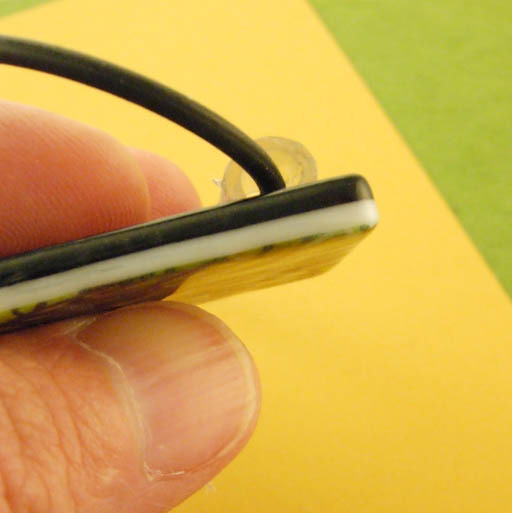 The fiber paper does not burn in the kiln therefore it leaves a channel/hole that goes through the glass pendant. It was all I knew when I began fusing, then I discovered wire wrapping and that evolved then came the standard silver bails. 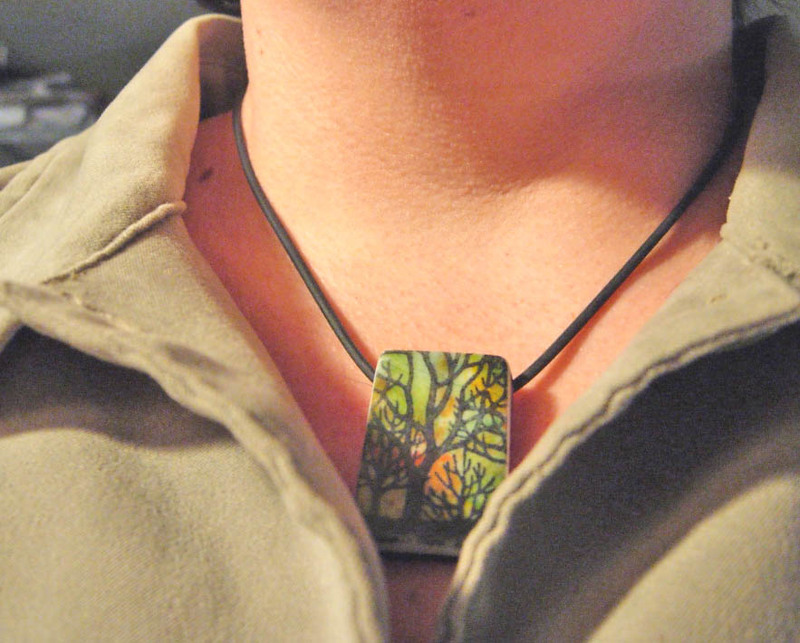 I am as usual looking for innovated ways to make pendants look and function different. Early this summer I started making sterling silver roll bails those are nice too and it really steps up the piece since the silver is expensive and I make the bails by hand. Within the last few weeks I have been working on a new way to wear the pendants- A no bail alternative to all these other devices. This is called the hidden rubber channel. I spent some time wearing and testing the strength of this and have found it to be quite nice, not to mention how great is lays on a neck, plus comfort. I have to say the thing I like best about it -NO BAIL, the piece stands on it’s own like art hanging in a gallery. EGA News Letter- Win FREE glass!